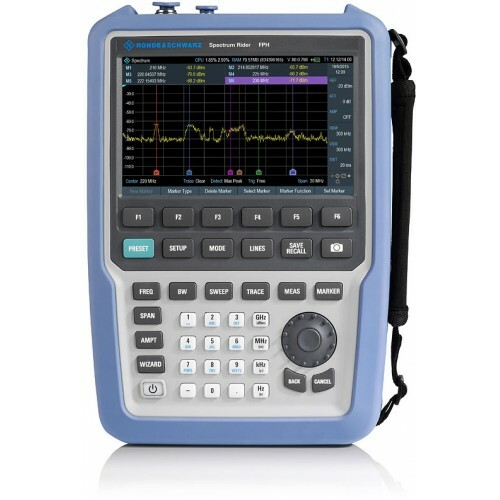 Rohde & Schwarz Spectrum Rider FPH, Handheld Spectrum Analyzer with frequency range from 5kHz to 2GHz. Accessories supplied: Lithium ion battery pack, USB cable, AC power supply with country-specific adapters for EU, GB, US, AUS, CH, CD-ROM with R&S®Instrument View software and documentation, quick start guide, side side strap. The R&S®Spectrum Rider features basic diagnostic capability for service or even development lab. It is ideal for EMI debugging to determine disturbance from a device under test during development. The R&S®Spectrum Rider offers a wide range of measurements, such as frequency and level measurements, spurious measurements, etc. Requiring only minimum bench space, the R&S®Spectrum Rider is the perfect tool for tasks in R&D labs and service stations. The R&S®Spectrum Rider can be easily remotely con- trolled via LAN or USB, which enables users to automate measurement scenarios. Using the R&S®Instrument View software, it is also possible to project the display on a larger screen. This makes the R&S®Spectrum Rider perfect for education purposes in schools and universities.